Free customer support and daily malware database updates. Free customer support for specific infections. SpyHunter is a powerful computer security tool that can detect and remove various types of computer threats. It has a user-friendly interface that makes the program easy to use, even for beginners. Its automatic configuration provides optimal system protection, but SpyHunter can also be customized in order to correspond to each user’s individual needs. SpyHunter can easily detect not only general malware infections, but also rootkits that are exceptionally dangerous and more frightening, because they are virtually invisible and run in the system background with intention to avoid detection and removal. SpyHunter offers a rootkit scanner function that can detect rootkits immediately. After it removes the rootkit, SpyHunter makes sure that the malicious infection does not regenerate. Spyware HelpDesk is one of SpyHunter’s key features. Spyware HelpDesk has been created for users who cannot remove a particular infection. HelpDesk has an interactive feature that you can use to contact technicians that create a custom fix for a problem unique to the compromised computer. Spyware HelpDesk is a SpyHunter feature that provides free assistance when an automated scanner cannot terminate a certain malicious infection. You can also make use of the SpyHunter Ticket System to interact with the SpyHunter customer support team and quickly get individualized help with specific issues. SpyHunter HelpDesk also includes Custom Fix functionality. If SpyHunter is not able to remove a malware infection automatically, the SpyHunter technical support team will generate a personalized custom fix for you, which they will directly transmit to SpyHunter to allow you to remove the infection at once. You can save time by scanning only a particular section of your system with the Custom Scan function. You can choose to scan Memory, Registry, Cookies, Files or Rootkits. System Guards allow you to take full control of all processes that run on your PC. This feature blocks malicious processes, protecting you from dangerous infections. System Guards let you know which process is about to be run, and you will be able to choose whether to run the process or to kill it. SpyHunter remembers which processes you allow and block, so you do not need to repeat your actions. SpyHunter scanner can be utilized by computer experts and beginners alike. You will initiate a full system scan with one single click, and a list of infections (if any) is presented immediately. If you want to find out more about a particular infection, click its name on the scan results list. All you need to do to remove the infections is to click "Fix Threats" button once. Use Scan Scheduler to setup a SpyHunter scan to automatically run regularly at particular intervals. Scan Scheduler allows you to make sure that the full system scan is run even if you are away from your PC. You can select between daily, weekly and monthly system scans. A full system scan will be executed if your computer is powered on at the set time. You can use Network Sentry to prevent malicious objects from modifying your Internet connection. Network Sentry will make sure that neither the Hosts file nor other Windows system files are maliciously modified by computer threats. You can also trust this feature to prevent browser hijacking and monitor your DNS settings. Network Sentry will immediately notify you in the case of any illicit modifications. SpyHunter’s Backup feature allows you to backup various objects and restore without any problem. At any point in the future, you can utilize this feature to restore any component that was removed by SpyHunter. Automatically check for updates – SpyHunter automatically checks for updates whenever it starts. Automatically download and install definition updates – SpyHunter automatically downloads and installs definition updates available. Start SpyHunter Security Suite on Boot – SpyHunter will launch automatically each time you turn on your computer. Start SpyHunter Scan on Boot – SpyHunter will launch and start a full system scan automatically each time you turn on your computer. 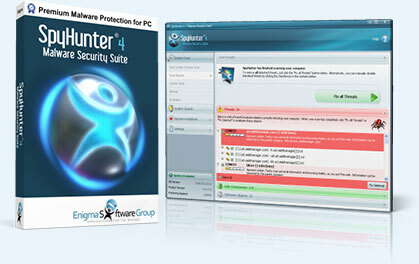 Minimize Security Suite on startup – SpyHunter’s real-time protection will function at full capacity, but SpyHunter will be visible as a taskbar icon only. Prompt if any important Windows components are disabled – SpyHunter will notify you if the Task Manager or any other important Windows component is about to be disabled. Prompt if web content is used on desktop – depending on your Windows settings, SpyHunter will notify you if active web content is used on your desktop. SpyHunter is certified by the West Coast Labs Checkmark Certification program, a highly regarded independent security and product testing service. All our transactions are encrypted using 256-bit SSL (Secure Socket Layer) protocol and are protected by our Geotrust Secure SSL® certificate. Click the Geotrust seal to learn more.